Split is a 2016 horror-thriller from writer-director M. Night Shyamalan. The film is a standalone sequel to Shyamalan's 2000 film, Unbreakable. The film received a film festival release in 2016, but was released to theaters in January 2017. 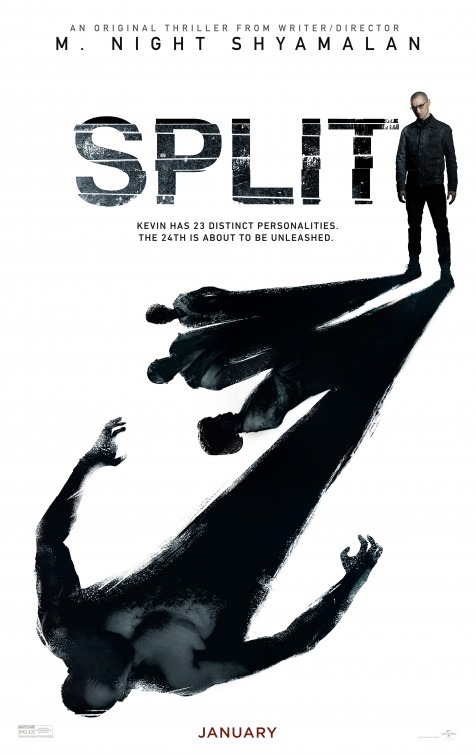 Split focuses on three kidnapped girls who desperately search for a way to escape their captor, a man diagnosed with 23 distinct personalities. As Split opens, Casey Cooke (Anya Taylor-Joy), a seemingly emotionally withdrawn teenager, is hanging out with her classmates, Claire Benoit (Haley Lu Richardson) and Marcia (Jessica Sula). The three teens are kidnapped by a mysterious man who has DID – dissociative identity disorder (also and formerly known as “multiple personality disorder”). The girls' abductor, “Dennis” (James McAvoy), is one of several personalities, as many as 23 according to Dennis' psychologist, Dr. Karen Fletcher (Betty Buckley). The girls are imprisoned in an underground bunker and held in a cell. Casey tries to befriend a young boy personality named “Hedwig.” From him, Casey learns that time is running out, as “The Beast” (a 24th personality) is coming, and the teens are to be sacrificed to him. Although Split has been out in the public for almost a year and a half, a little more including its film festival release, I still want to be careful about spoilers in this review. I can say that James McAvoy gives a dramatic tour de force performance in multiple roles. Honestly, I have thought of him as a good actor since I first saw him in two Academy Award-winning film, The Chronicles of Narnia: The Lion, the Witch and the Wardrobe (2005) and The Last King of Scotland (2006). It is this performance, however, in which McAvoy reveals that he has the techniques and skills of a top-form actor and the qualities of a movie star. Goodness gracious! The camera made love to this dude, and I could not get enough of him. McAvoy took each personality that director M. Night Shyamalan revealed and gave us a unique and alluring individual. Speaking of Shyamalan, he proves with this film that he has always been a exceptional filmmaker, even when he was making mediocre films (The Last Airbender) and box office bombs (The Lady in the Water – which I love, by the way). I have thoroughly enjoyed his movies (Unbreakable, Signs, and The Village) even when I hate the “twists” and “shock reveals” in the last acts of those films. Split is good, beginning to end. Shyamalan has unleashed his inner Hitchcock to create a film that is difficult to ignore once you start watching its astonishing twists and turns. I would be remiss if I did not mention Anya Taylor-Joy as Casey Cooke. I think that she is as much the star of this film as James McAvoy is. In a way, she embodies the heroic journey, and she spins the familiar teen female victim of horror movies and thrillers and turns her into a stalwart figure, the unbreakable, unsinkable heroine. Obviously, I love Split. I wish I had seen it in a movie theater, and I am not reluctant to recommend it to fans of thrillers. It is not just a good movie; it is also one of the best films of 2017. The text is copyright © 2018 Leroy Douresseaux. All Rights Reserved. Contact this blog or site for reprint and syndication rights and fees. VIZ Media Launches "My Hero Academia: Vigilantes"